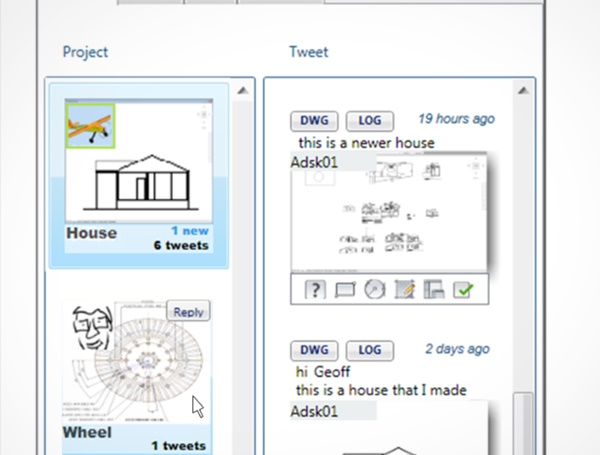 We describe TwitApp, an enhanced micro-blogging system integrated within AutoCAD for design sharing. TwitApp integrates rich content and still keeps the sharing transaction cost low. In TwitApp, tweets are organized by their project, and users can follow or unfollow each individual project. We introduce the concept of automatic tweet drafting and other novel features such as enhanced real time search and integrated live video streaming. TwitApp leverages the existing micro-blogging system and the user community. Content delivered with each tweet are stored and managed using multiple web services. The user reaction from our evaluation was positive and supports our belief that providing within-application, data rich, microblogging capabilities can enhance design sharing.